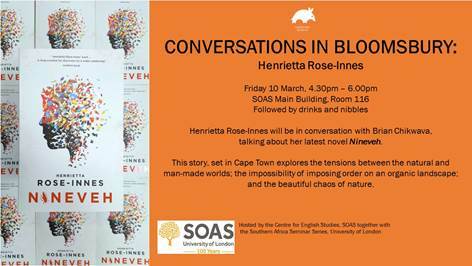 Hosted by the Centre for English Studies, SOAS, together with the Southern Africa Seminar Series, University of London, the next edition of the Conversations in Bloomsbury events will stage two Caine Prize recipients in conversation—Henrietta Rose-Innes and Brian Chikwava. 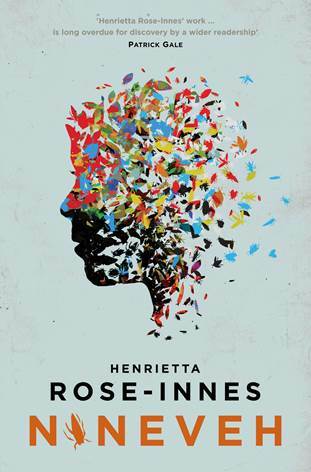 South African writer Henrietta Rose-Innes’ literary reputation precedes her latest novel, Nineveh(published in the UK and US in 2016): she’s won the HSBC/PEN Short Story Prize in 2007; she’s been anthologised in the Granta Books of the African Short Story (2011); and she’s also been endorsed by J M Coetzee and Neel Mukherjee. The second of her two-book deal with Aardvark Bureau, Green Lion, is scheduled to release later this summer. Currently completing a PhD in Creative Writing at UEA, Rose-Innes will be at SOAS to discuss her Cape Town-based story—shortlisted for South Africa’s “most prestigious” literary award, the Sunday Times Fiction Prize in 2012—which straddles speculative fiction genres, and steps across natural and man-made worlds in the body of her ethical pest removal specialist-protagonist, Katya Grubbs. Brian Chikwava—best known for his debut, Harare North—is a Zimbabwean writer, whose works have also appeared in anthologies published by Picador, Granta, Weaver Press, and Jacana, among others, and who is also an associate editor at Wasafiri magazine. We welcome you into these two authors’ worlds as they share words on South African speculative fiction, Caine Prize cultures, the art of studying Creative Writing as an academic discipline, and more. The event takes place on Friday, 10 March, 4.30 – 6.00pm in the SOAS Main Building, Room 116.